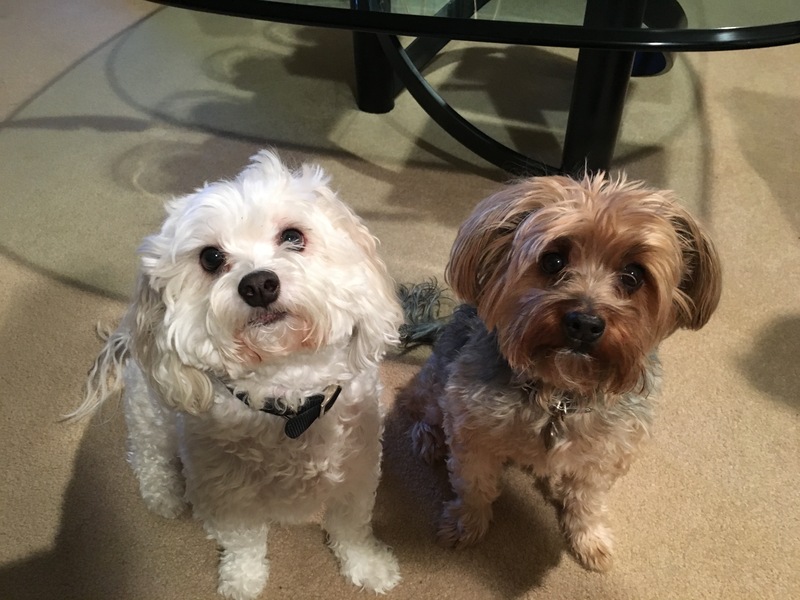 Lexie (left) is a five-year-old Bichon mix who gets excited and over barks when people arrive. She also attacks Misti and the TV when she hears or sees animals on the screen. The guardians also wanted me to help get Misti (right) to not get so excited or over bark when guests arrive. While the dogs were certainly excited for my arrival there Burkette a little bit of territoriality to it. When dogs jump up on arriving visitor it is there way to try to claim them or let them know that they are on the dog’s turf. Later on in the session I showed the guardian how to claim the area around the door and communicate to the dogs that they are to wait on the far side of the room whenever anyone arrives. Placing yourself between the dog and the arriving guest, and making sure the dog keeps respectable distance, is a great way to diffuse dog door excitement. It will take a little practice, so I suggested that the guardians call or text one another when they are returning home so that they can play the part of an arriving guest. Most dogs only need 6 to 12 practice sessions before they start staying away from the door on their own. We headed into the basement so that we could chat about the dogs daily lives and their guardian’s expectations for the session. When I asked the guardians what rules or boundaries were in place for the dogs, they had difficulty coming up with any examples. Dogs go through life probing to test boundaries and limits. In fact some behavior us estimates that half of canine human interaction is correcting or reinforcing the dog’s actions. Because their guardian said not Inc. any rules for the dogs, the dogs got the impression that there was no leader in place. After all it’s the leader who sets and enforces the rules. The humans also obliged the dogs most of the time when they asked for things; to be fed, to be petted etc. well there’s nothing wrong with the dog asking a human for something, if the human complies most of the time and fails to provide the dog with rules and structure, it’s not uncommon for the dogs to get the impression that they are the authority figure in the home. So it was pretty easy to see that most of Lexi and Misti’s unwanted behaviors were a result of lack of rules and structure. The great thing about the situation is how quickly and easily it can be corrected. I suggested a few rules and show to the guardians how to enforce them. It will be crucially important for the guardians to disagree with the dogs the instant they start to engage in any unwanted actions or behaviors. Another great way to redefine the leader follower dynamic in the home is to practice what I call petting with a purpose. It will take the guardian’s a week or two to become accustomed to this new way of interacting with their dogs. It can be challenging for some dog guardians who feel that not providing the dog with constant attention and affection is akin to neglecting it. But dogs do not see unconditional love the same way that humans do. In fact, if it is provided without structure and discipline it can often reinforce the dogs belief that their leadership is needed. To help the guardians better communicate with their dogs, I went over some nonverbal communication methods as well as a set of escalating consequences that I like to apply when a dog breaks a rule or gets into trouble. To help the guardians practice using these new communication methods, I showed them leadership exercise I developed a few years ago. After running through it a few times with Lexi, I coached her guardians through it until they got the same result. Just to be sure that Misty didn’t have any problems with the exercise, I ran through it with her a few times. She challenged less then Lexi did, showing a slight amount of timidity. Still, mastering the exercise will deepen her respect for the guardians while also better enabling her to restrain herself when people came to the door. After only two repetitions she was ready to practice the exercise with her guardians. The leadership exercise is one of my most popular rehabilitation methods because it helps the humans practice leading and correcting their dog Innoway the dogs understand and respect. Better still, the exercise helps the dogs develop the ability to restrain themselves while also looking at their humans as the true authority figures in the group. I recommended that both guardians practice the leadership exercise with each dog individually over the next week or two. At first they need to conduct the exercise until the dog lays down. What’s the dog starts laying down right away then they can start increasing the amount of time that the dog is expected to wait before it receives permission to retrieve it’s reward. I gradually increasing this delay, we can help the dogs understand that restraining themselves when requested by human is an activity that will be rewarded. This will pay huge dividends in any area where the dog tries to assert itself or gets over excited such as when visitors arrive at the door. When we were finishing Misti’s practice at the leadership exercise, the guardians mentioned that they were having difficulty training the dogs to use puppy pads. One of the dogs had recently just gotten over having a broken leg, so mobility issues had resulted in the dog preferring to eliminate inside. I went through the method that I like to use when training a dog to use a puppy pad, as well as offering some general potty training tips and suggestions. But at the end of the session both dogs were already adopting follower behaviors. They were paying more attention to the humans as they moved about the room, deferring to them when they walked in the dogs direction as well as listing to commands and corrections right away. Now that the guardians know how to communicate with the dogs nonverbally they will be able to apply these methods to more effectively disagree with the dogs before they start to engage in unwanted behaviors. If they consistently disagree with the dogs with good timing, it shouldn’t take long for this pack to learn what behaviors are and are not allowed. I sense the both of these dogs what to make their humans happy. It was just that the humans were communicating what they wanted from the dogs in a way that the dogs understood. Now that everyone is on the same page it shouldn’t take long put a stop to most of these unwanted behaviors.